When traveling to Halong Bay, you should not miss chance to visit Thien Cung cave, that is one of the most beautiful caves in Halong. 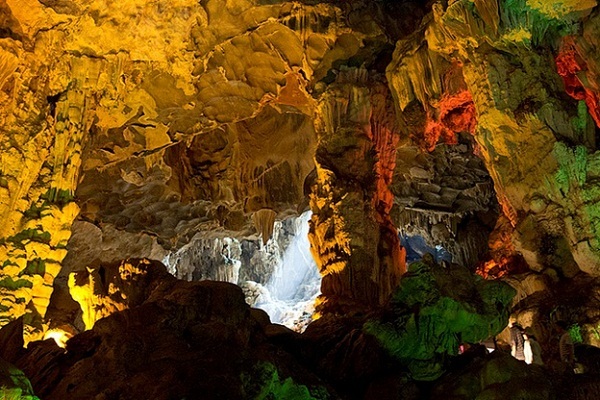 Thien Cung cave- a glorious place of Halong Bay is remarkable with numerous stalactites and stalagmites in strange shapes. You can book 2 day and 1 night tour on a cruise traveling around the bay and visit Thien Cung cave such as Halong bay cruises, Halong bay tour, Halong bay trip, Indochina Sails Cruise, etc. The name “Thien Cung” means a magnificent place like the palace of God. 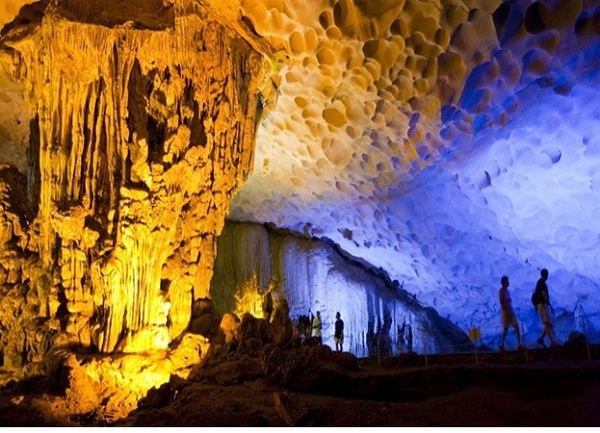 This cave is located in the southwest of Halong Bay, 4 kilometers from cruise ship port on Dau Go island. On the road climbing inside the cave, there are numerous cliffs, covering both sides as luxuriant trees. Through a narrow opening, the cave suddenly opens up space above a quadrilateral ground with a length of 130 meters. The deeper you come inside the cave, the more surprised you will get. It is the extremely vivid, splendor beauty created by the stalactites here. The east wall is a massive painting emerged as ancient fairy characters with soft, flexible contours and elaborate details. The sculptures of the cave, from small to massive shapes, are meticulously polished by the Creator’s hands. 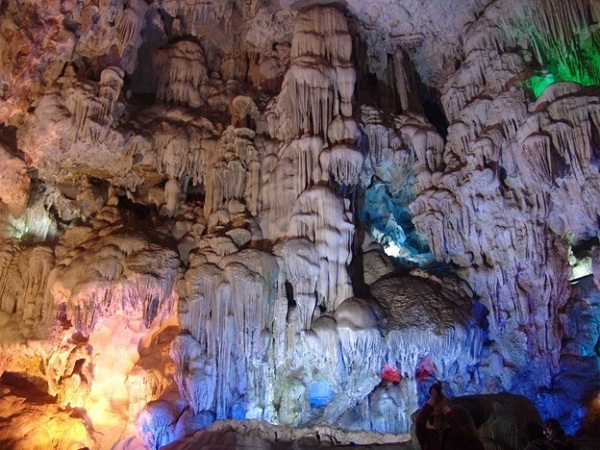 It is told that Thien Cung Cave associates with ta legend of the ancient Dragon King. After having helped people to defeat the enemy, Dragon King came back to his cave. Unfortunately, it was badly drought during that year, hence people lost crop miserably. Therefore, they had to bawl Dragon King for help to make it rain, but many people had gone without a return date. No afraid of danger arduous, a young couple determined to seek the Dragon King. They had a beautiful little daughter and named her Cloud. Cloud grew up and made ​​the Dragon Prince’s heart vibrate and love helped them find each other. Then wedding was being hold for 7 days and 7 nights in the center of cave. To celebrate the wedding, dragons flew in the cloud forest of stalactites, little elephants danced, the largest pythons slithered their body, wrapped around ancient banyan tree, two rock lions danced, mane of hair flew and eagles outstretched giant wings. A large elephant decorated elaborately had been lying to wait the bride and groom stepped down. The scene was extremely jubilant, boisterous. The center of the cave comprises four major pillars to hold up the heaven. From the feet to the top of the column, visitors could see many strange shapes like fishes, birds, scenes of human activity, flowers, etc. Also, a scene of some pretty fairies dancing to congratulate the wedding is the decoration of the north wall. Under the surround of cave, clusters of colorful stalactites create a splendor natural stone curtain. Somewhere, there are flickering drums like in the old village festival, stirred up the atmosphere with wind blowing through interstitial stone. Looking at the surround of cave, you can view a sky of stalactites colored in blue as gems and feel as standing in a fairy scene. 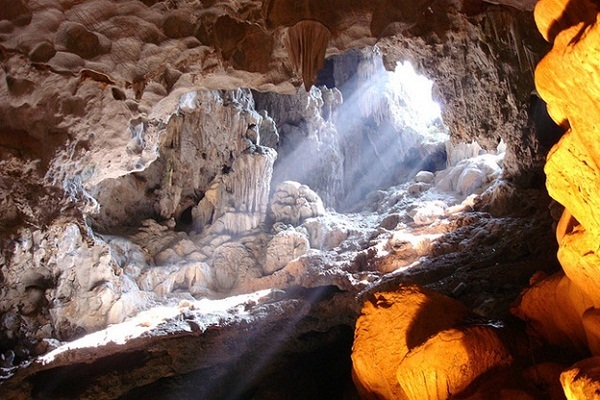 Visiting Thien Cung cave, you will surely have astounded moments of being immersed in the magnificent natural scenery.